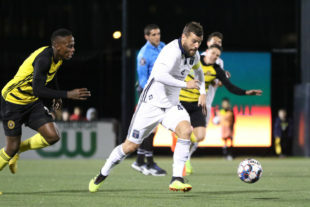 Bethlehem Steel beat their parent club to an important milestone on Saturday night — the first playoff win of their three-year existence. It was, in many ways, a rock fight, as Tim Jones ably laid out in his match report. In the second half of extra time, it looked like Pittsburgh Riverhounds had a firm grip on the match, as they’d just taken a 2-1 lead. But a dangerously positioned free kick right at the top of the box changed everything. The goalscorer was Steel captain James Chambers, one of the team’s only veterans and a rock-solid defensive midfielder. The 31-year-old Irishman produced that sumptuous free kick at the best possible time. He also converted his attempt in the shootout. Chambers’s contributions to Bethlehem extend beyond just one game and even beyond the pitch entirely. Aside from his play on the pitch, Chambers plays a key role as mentor to the younger members of the squad. Brendan Burke cites his leadership as a major reason for the team’s success. He, for example, has credited Chambers’s relationship with Olivier Mbiazo with encouraging both the youngster’s English development and his willingness to joke around with his teammates. On a developmental side like Bethlehem, that sort of leadership is invaluable — and not always found in every player. If you’re looking to learn more about the veteran, Chambers sat down with PSP homegrown Adam Cann on the Union’s Pitchside Podcast this week, chatting about how he ended up in Bethlehem and his career as a professional soccer player. It’s worth a listen. Steel’s playoff run might not last much longer. They travel to Louisville to take on the top-seeded defending champions on Saturday night — the same team that knocked them out of the playoffs last year. For the young Bethlehem squad, it presents a massive test. They’ll lean on their captain at least one more time to anchor the squad — just like he did last Saturday night. For that, James Chambers is PSP’s player of the week. What’s the likelihood he ever puts on Union blue? wears it as a coach almost everyday. El P hasprobably warched him at work with the U11s in the pre-Academy, so his view outweighs mine in value because mine is hearsay, not direct witness. I have heard very good things about his work there. Having said that he remains the second-best offensive distributor from the 6 in the organization behind Medunjanin. Reportedly, he was coveted by the Union for the Frankfurt exhibition match, but the Steel had a league game simultaneously, and he rightly stuck with his youngsters. And he’s a fantastic trainer – done some past work with the Southampton Soccer Club – kids loved him and worked their tails off for him. Highly recommend him.